Go to the ‘Account’ tab (top right of MinuteDock). Click ‘Manage’ next to the user. Select and deselect the permissions as needed. When you add a new user they can see all the contacts by default but can’t add/edit them. Admins can limit the clients available to users. Projects are linked to contacts so they will be able to track time to all projects under the contacts they have access to. Click on ‘Manage’ next to the user you want to limit. Click on ‘More options’ to show additional settings. 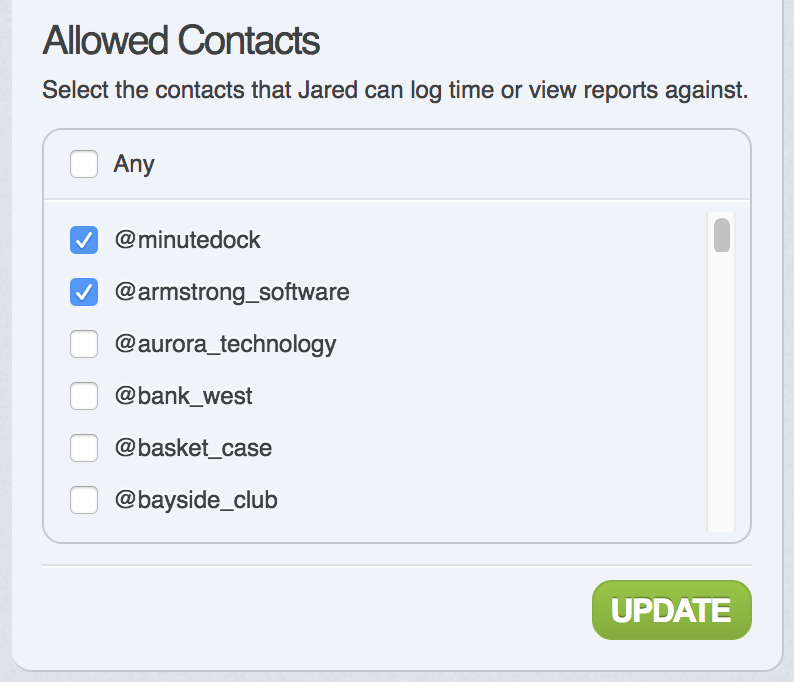 Under ‘Allowed Contacts’ section select and deselect which contacts the user can see. This will also restrict their access to projects related to those contacts. Selecting this makes a regular user into an Admin. It will show the Account tab on their MinuteDock account and it will allow the user to view, add, manage permissions for and remove other users. It will automatically apply all of the permissions described below to their account. If you deselect this again, you can choose to give a user one or more of the below permissions. This will show the Invoices tab on their account. It will allow the user to view, create, edit and send invoices. They will be able to see all time entries and hourly rates for users, contacts, projects and tasks. This will show the Contacts tab on their account. It will allow the user to view, add, and remove contacts. They will be able to see contact’s hourly rates. 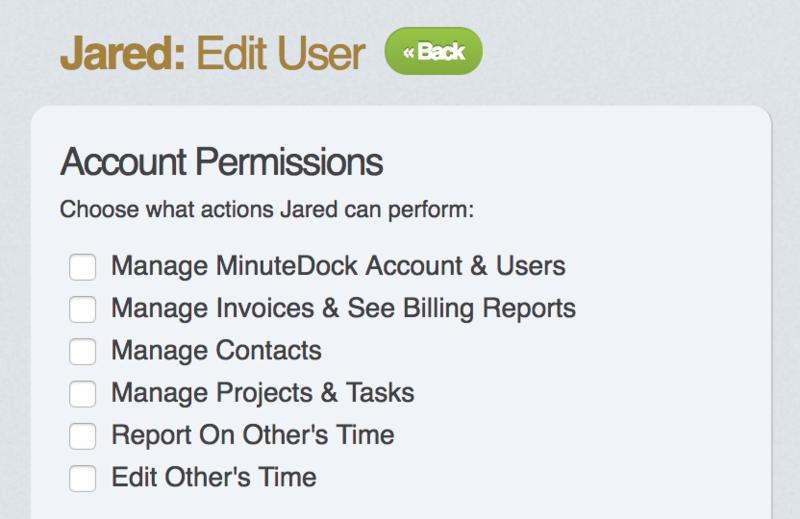 This permission will show the Projects & Tasks tab on their account. It will allow the user to view, add, and remove Projects and Tasks. They will be able to see the hourly rates for Projects & Tasks. This permission will allow a user to see other users’ time entries, and create reports that include all users’ time entries. This permission will allow a user to see other users’ time entries and goals, edit their time entries, and even track time on their behalf.